my friend munster: Don't be such a crepe! Don't be such a crepe! When I decide that I want to eat a particular kind of food, I'm essentially useless until I've got my hands on whatever it is I want. It pretty much consumes my entire being and I can't think about anything else. Tonight I decided that I wanted a strawberry crepe more than anything else in the world, and so Sam and I took a trip to Mothers Crepe + Chatime on Grote Street in the city. I had Mothers Crepe on our trip to Sydney in 2013 and I kind of just forgot about it until today, when I remembered that there was a store in Adelaide and I didn't have to lead a sad, crepe-less existence. What's amazing about Japanese style crepes is that they often contain things that you probably wouldn't expect to be rolled up in a fluffy, delicious cone - like whole brownies or slices of cheesecake - and that's what makes them so bloody wonderful. I had the Caramel Strawberry Cheesecake Soft Ice Cream Special (try saying that three times fast), Sam had the Choco Banana Special, and we washed them down with a chocolate milk tea with sago bubbles from the Chatime side of the store. The crepes were a wallet-friendly price of only $6.50, and we were absolutely stuffed afterwards. In short, it was a quick delicious meal that didn't break the bank, which is all I really want when I go out to eat. tI think it's safe to say that my sweet tooth is satiated for at least another week, but I can't promise anything! 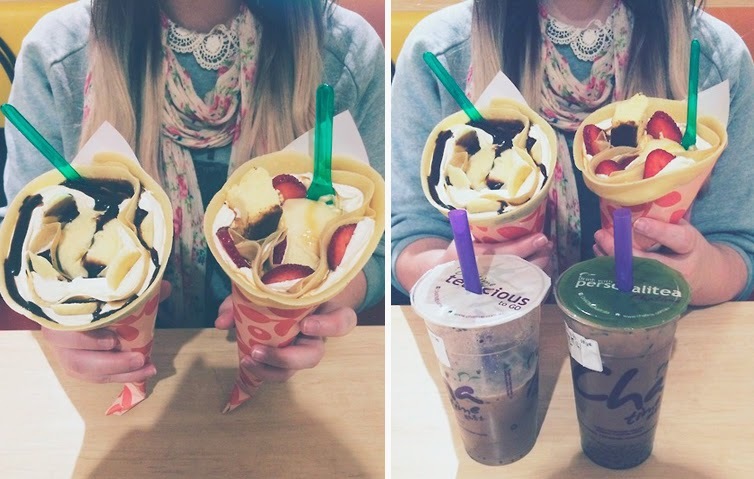 Those crepes look amazing! I've never had them like that in a cone. There's a yogurt and waffles place by my house. It sounds weird but I had a waffle topped with strawberry yogurt and melted peanut butter and it was delicious!